The SLT project is focused on improving safety and mobility for the SLT Corridor and the surrounding highway system and to some extent the City of Lawrence. 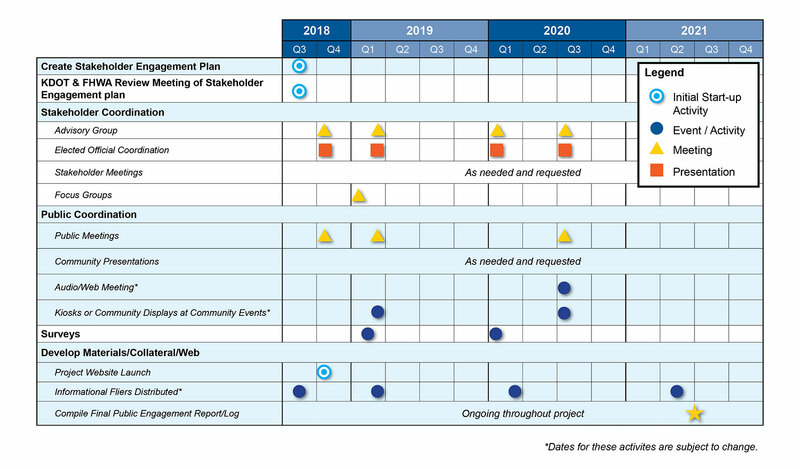 Preparation of the Supplemental Environmental Impact Statement (SEIS) will build upon the work performed for the EIS reevaluation within the Concept Study, with additional analysis of a range of project funding options. The SEIS will review the findings of the original EIS, consider the results of the West Leg Concept Study and evaluate new or additional environmental impacts based on new improvement options and/or major changes in the natural environment or communities. The SLT SEIS will evaluate if – and how – upgrading the corridor to a four-lane freeway, modifying access, and exploring new funding mechanisms alter the impacts and recommendations previously identified through the 1990 EIS and 2008 East Leg EIS. Below is the general schedule for activities as we have identified them at this point. We will update schedule if there are significant changes. Initial Start-Up Activity Event/Activity Meeting Presentation *Dates for these activites are subject to change. The overall project study limits begin just north of Interstate 70 at North 1800 Road/Farmer’s Turnpike and extend to just east of the existing K-10/23rd Street system interchange. The project length is 19.0 miles.